If you are an outdoorsman, there is a very good chance that you are also a weather watcher... As you know, weather conditions dictate so much about what we do in the outdoors. They help us decide where to go, what activities (whether fishing or hunting) to pursue, and also determine the endeavors that will most likely prove to be successful for us. For me in particular, this past week turned out to be a prime example of weather watching. I had off work this past Tuesday and Wednesday and had made plans (some time ago) to do some saltwater fishing with my good buddy Pete. Unfortunately, the weather forecast looked terrible... Calling for rain and strong winds coming f rom the wrong direction. Pete and I both wanted to go striper fishing very badly, but in the end we decided it would be best to postpone our trip in hopes of trying again under better conditions next month. 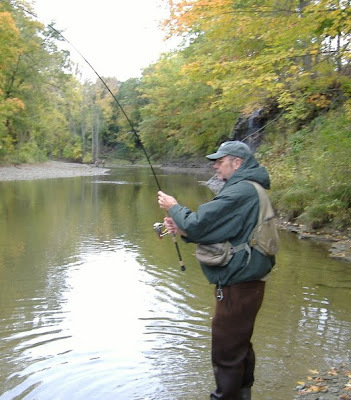 Still, after a quick check of the forecast, and a phone call with my father... my Dad and I decided to head out on a last minute trip to Erie, PA--where the weather looked more favorable and with any luck, the steelhead would be biting. We arrived to the Erie area in the early afternoon on Tuesday, and found the creeks to be low and clear. 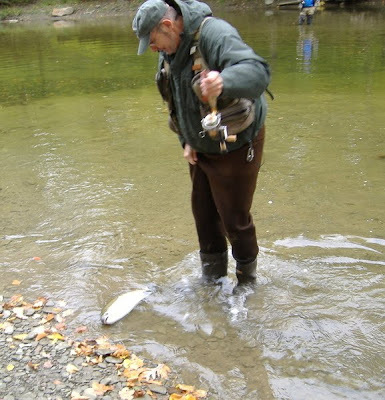 Conditions were not great, but at least they were fishable and it seemed that there were good numbers of fish in the streams. Our first stop was at Poor Richard's Bait and Tackle, where we picked up some goodies, and then headed off to Elk creek in search of some fish. We ended up fishing Tuesday evening until dark, and then again Wednesday morning until about 10 am, before we decided to call it quits. It was a very quick trip, but we both had some fun and caught some decent fish... about 15 in all, with most coming on the drift rods using either live shiners or single eggs, for bait. 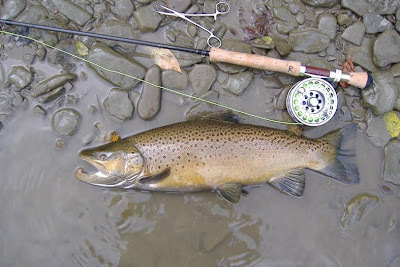 Dad, scored a nice brown trout on the fly rod though, which was a special treat for Erie. Even though condition weren't optimal in Erie the past couple of days, they were much better than along the coast. Likewise, we were fairly successful stee lhead fishing--probably much more so than if Pete and I would have decided to brave the elements and head out to the beach. I am certain that most of you guys and girls do follow close attention to the weather conditions, but if you do not, there really is no better time to get started than now... It will help you pick and chose the best opportunities for your outdoor endeavors. I have a lot of links listed along the left side margin of this blog, and one section in particular is dedicated to the weather, stream flow data, tides, and sun & moon phases. If you get a chance, check out the links in this section... I do not get paid anything for you to click on them. I have them listed purely for your own reference and to help you out with whatever you chose to do. I find the US GS stream flow link to be particularly interesting and helpful, and I hope you find it and the other links useful as well. Also, if there are any sites that you know of that might be better than the ones I have listed, please let me know and I'll check them out. Thanks again for reading and I hope you enjoy the pics from this past week's trip!